Go with the streamflow – Anne Jefferson joins Real Scientists! We are excited to welcome Anne Jefferson (@highlyanne) as our new curator! Anne is an Associate Professor in the Department of Geology at Kent State University in Kent, Ohio, and is also a Leshner Leadership Institute Public Engagement Fellow of the American Association for the Advancement of Science (AAAS) in 2016-2017. Her research focuses on urban watersheds and stormwater management, hydrologic responses to climate variability and change, and landscape evolution. The goal of her research is to improve the resilience and sustainability of water resources and aquatic ecosystems in the Anthropocene. To this end, she engages in interdisciplinary collaboration with ecologists, social scientists, engineers, and architects. 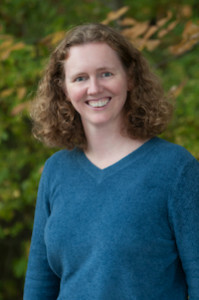 She earned a Ph.D. in Geology from Oregon State University and has been an assistant professor at the University of North Carolina at Charlotte as well as an Associate Editor of the Geological Society of America Bulletin. I love the outdoors and the natural environment, but I’ve also always been fascinated by people and the way they reshape the world around them. D uring my MS and PhD, I worked on some pretty wild and remote places. When I started my first faculty position in Charlotte, North Carolina, I came to realize that most people didn’t see pristine water springing from mountain hillsides. Instead, they saw streams in culverts or flowing through subdivisions, if they saw them at all. I grew increasingly fascinated by streams in cities, and almost 10 years later I’m still finding lots of new things to learn. Most of my work revolves around urban streams and watersheds. I’ve been doing a lot of work on the way we manage urban runoff, what we call stormwater, and some of the innovative ways that people are designing to treat it (e.g., green roofs and bioretention cells). I’m also interested in climate change and its effects on water resources. I’ve worked on the effects of changing snowmelt patterns on streamflow in the Pacific Northwest and I’m hoping to integrate climate change work into my urban research over the next few years. I’m also fascinated by the way that landscapes evolve as water flows over and under them over many years and, in turn, how the shape and properties of the landscape influence the flows of water. A colleague recently put it this way: “There are 3 problems with water. There’s not enough of it. There’s too much of it. Or it’s not the right quality.” I thought that summed it up pretty well. The work I do can directly inform decision making (e.g., should we put in a stormwater pond or a green roof? ), motivate changes in personal behavior, and inform our appreciation for the world around us. Right now, I am a AAAS Leshner Leadership Institute Public Engagement Fellow. I am part of a cohort of 15 scientists who study various aspects of climate change, its impacts, and the way society responds to it. We have a mission to increase public engagement with climate change science, by trying out innovative approaches and using the science of science communication to inform our efforts. We also have the mandate to transform our institutions along the way. It’s a daunting task, but my cohort is filled with impressive and enthusiastic people, so we are doing our best work. I like hiking (particularly along rivers), reading, and spending time with my family. I get to enjoy my ideal day off pretty regularly. It starts with a lazy breakfast with my family and a walk down to our local farmers market for lots of produce, bread, and more. If we are ambitious we might also add a quick trip to the local library. Then after lunch, we head out to one of the many parks in our area for a hike, exploring a new area or retreading favorite paths. Fun and snuggles with the kids, and then a good book and a cup of tea wrap up the day. Please welcome Anne to Real Scientists!